FOR the first time in New Zealand politics three high profile Asian people are set to contest an electorate seat in a general election. IN THE CONTEST: Act leaders Sir Roger Douglas and Rodney Hide with the party's Botany electorate candidate Kenneth Wang. Photo supplied. Reflecting the Botany electorate’s diverse ethnic makeup, the National and Act parties have nominated candidates with strong connections and networks in new migrant Asian communities. Labour is understood to be contemplating a similar selection strategy, after its first preferred candidate stood down recently. Long time National list MP Pansy Wong was confirmed earlier this year as its Botany candidate (Times, February 7). Act announced last Friday that its former list MP, Kenneth Wang, who has contested three general elections as one of its candidates, as its man for Botany. Labour is deciding on a new candidate, as its first selection, union rep Brenden Sheehan, has stepped aside after being confirmed earlier this year. It has been reported that lawyer Raymond Huo, who also writes and works in multi-media and broadcasting, is soon to be chosen as its Botany runner. 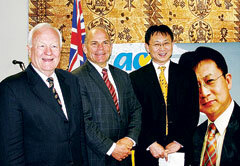 Mr Wang entered parliament in November 2004 from the Act Party list as a replacement for disgraced MP Donna Awatere Huata. He served as an MP for a year until the general election of 2005. Flanked at the announcement of his candidacy by Act founder Sir Roger Douglas and party leader and Epsom MP Rodney Hide, Mr Wang outlined some of his pledges and three key platforms: safe community, better living standard and one law for all. “Getting tough on crime is an overwhelming outcry from our people,” says Mr Wang. “Three years ago I initiated a nationwide petition [drawing 4936 signatures] with Mr Man-chao Li, who suffered three burglaries and could not get justice. “The petition was to toughen the law on youth crime, to make parents of young criminals share responsibility, financially and morally, and to ensure law-abiding citizens can self-defend their families and their property without waiting for criminals to strike first. “Our people are sick and tired of the debate between the two major parties over how many blocks of cheese their tax policies might equal to. Our people are looking for a party that has a vision to bake a much bigger cake of prosperity for us all to share. “While reducing tax is still a key policy to stimulate productivities, Act has got the vision and policies to substantially lift our economy and beat the income level of our neighbour Australia. Act founder and former Labour Finance Minister in the 1980s Sir Roger was recently selected as Act’s candidate in his home electorate, the resurrected seat of Hunua (Times, June 11). The new Botany seat was confirmed last September and includes most of the Botany/Clevedon community board constituencies and takes in small parts of the Manukau East and Pakuranga electorates, including Cockle Bay. Tel 09 271 8000 | 50 Stonedon Dr, East Tamaki, Auckland | PO Box 259 243, Greenmount Manukau 2141, New Zealand.